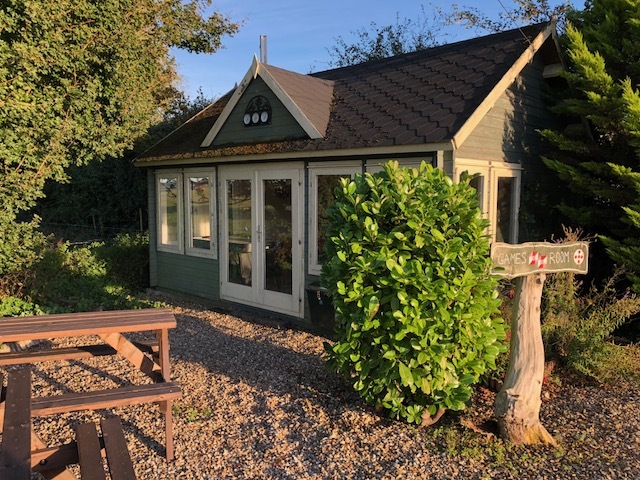 On a long weekend this October, the Parent Friendly Stays clan were lucky enough to spend a few nights relaxing at Dorset’s Lancombe Country Cottages & Lodges. Here’s our review of our Lancombe holiday – and don’t forget you can also read more about Lancombe in our full Parent Friendly Stays listing. You might also like to visit the Lancombe Country Cottages website directly to start planning your own holiday! Lancombe has a number of differently sized cottages and lodges (some with hot tubs) to suit all requirements and tastes. As a family of five with children aged 8, 6 and 4, we chose Frome Cottage which offers three bedrooms: a double, a twin and a single. Downstairs, our self-catering cottage benefitted from an open plan living space with lounge, dining room and kitchen. Both the front and back of the property open onto child friendly green spaces, with a shared play area at the rear and a small sun-trap terrace with table and chairs at the front – perfect for an early evening beer after a busy day out. Our first impressions of Lancombe were very positive. Our cottage was cosy, well-equipped and spotlessly clean (Mrs PFS is obsessive about cleanliness but even she was impressed). We were grateful for the welcome tray of biscuits, tea, coffee and milk, and also for the inclusion of little extras around the cottage like tin foil, cling film, soap, washing up liquid, scourers and toilet roll which – despite our fair share of self-catering holidays – we rarely remember to bring with us. Our children are old enough not to need them, but we spotted a high chair and travel cot in the cupboards for those travelling with younger tots. Facilities at Lancombe are perfect for a young family like ours. 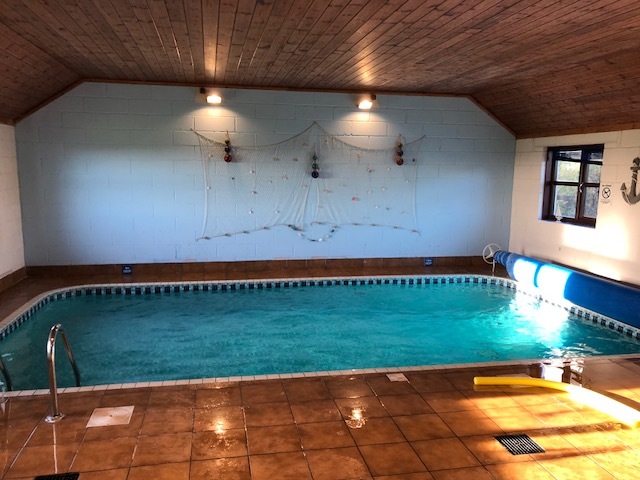 We made daily use of the child friendly swimming pool, located just a few doors down from our cottage; we loved the warm water temperature and fun selection of floats and balls, plus the adjacent grown-up friendly sauna and handy showers. The pool isn’t huge so felt a bit crowded when two or three families happened to make use of it at the same time (or, at least, we felt bad about the loud excited shrieks emanating from our gang) but for us that was a rare occurrence and easy to check before turning up. 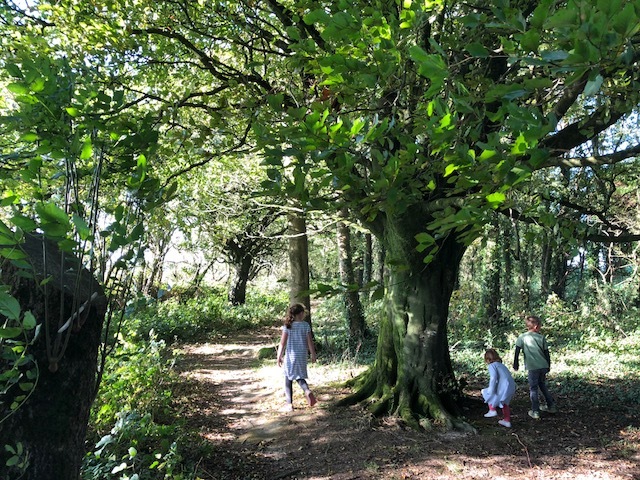 Elsewhere on the site there’s a lovely woodland footpath fairy trail decorated with tiny magical scenes; this was a big hit with our four year old and an easy way to tempt her outside for some fresh air. The red post box for letters to the fairies was a particularly nice touch. All the younger visitors at Lancombe were clearly making the most of the safe, outdoor space which incorporates swings, netball hoop, swing ball and lots of open grass for football and cricket. There’s also a communal BBQ area which, though it wasn’t quite warm enough in October for us to use, is clearly a hub for evening relaxation in the summer months. Lancombe’s small but well-equipped games room was a hit with our children, with table football, air hockey, a selection of toys for younger tots and an excellent selection of DVDs (with plenty for the adults as well as the kids). Situated in the Dorset countryside around ten miles north west of Dorchester, there are plenty of child and family friendly days out in the local area. 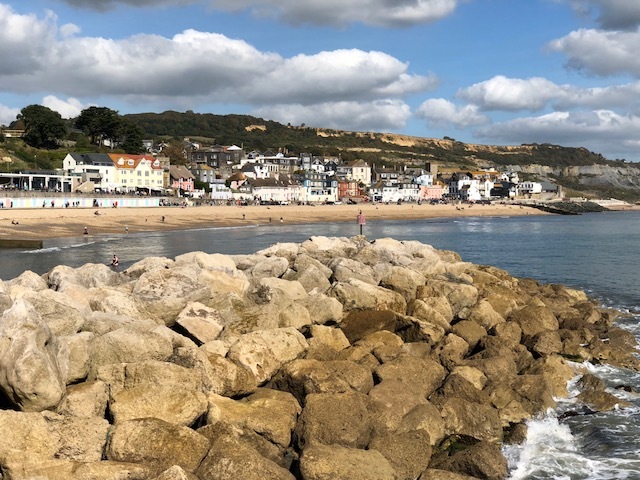 We were particularly keen to spend some time visiting the famous and beautiful Jurassic Coast, and on our first full day spent an enjoyable few hours mooching around Lyme Regis. It’s a picture-postcard seaside village with numerous cafes, pubs, bakeries, art galleries, museums, beaches and the famous Cobb harbour walls. On the following day, inspired by Lyme Regis’ family-run fossil and dinosaur museum which our kids loved exploring (£16 for a family ticket), we ventured to nearby Charmouth and – along with plenty of other keen palaeontologists – found a small section of the cliff to claim as ours and excavate. We were ill-equipped compared with some visitors who had brought digging tools and hammers with them, but nevertheless the kids were delighted with their fossil finds – some small ammonites and several ‘sharks teeth’ (later determined by the local shopkeeper to be evidence of rather more common belemnites aka squid). Climbing the steep cliff at Westbay was an effort well worth making! 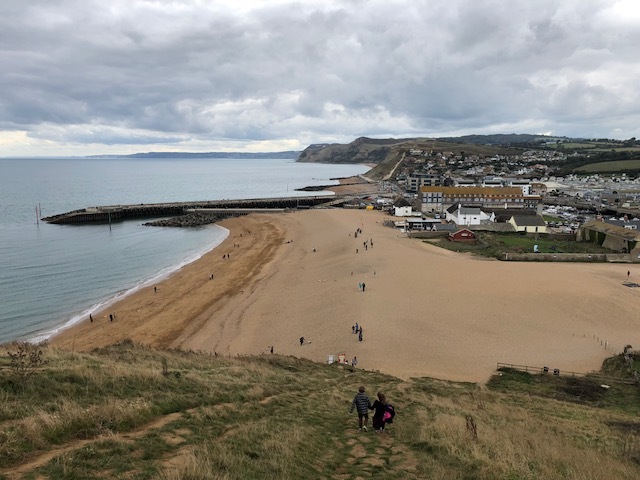 Our last port of call was another seaside town, this time Westbay; more famously known as the home of the dramatic cliffs featured in ITV’s Broadchurch drama. We probably appreciated the television connection more than the children, but nevertheless our gang enjoyed the challenge of clambouring up the steep coastal path to obtain the breathtaking views awaiting us at the top. So back to the Lancombe review..
Would we have changed anything? Certainly nothing dramatic: the cottage, location and facilities were all exactly what we’d hoped and made for a fantastic long weekend away with the family. In an ideal world the complex might have had a bigger play park to occupy the kids for a bit longer; and the on-site shop didn’t seem to be open often or have much in the way of day-to-day groceries available (though we note we visited out of season). Our WiFi didn’t work but, to be honest, we hardly noticed as family holidays are a great opportunity to have a break from phone notifications and social media – and we suspect it would have even easily fixed if we’d actually mentioned it to anyone. Those are just tiny nitpicks though. 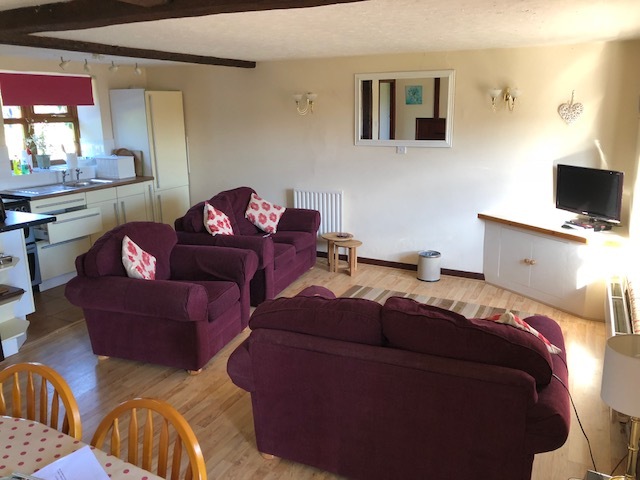 Lancombe is a wonderful child and parent friendly cottage complex: large enough to offer a range of great facilities, but small enough to feel cosy and welcoming. Our friendly host, Caroline, made the effort to check up on us more than once that we had everything we needed, and Bob was great with the kids when they were invited to come and feed the chickens and collect eggs. The small touches, like the Lancombe postcards ready and waiting for the kids to post to the grandparents free of charge, were really welcome. The countryside around Lancombe is beautiful – and right on your doorstep! It must also be said that in our experience, the prices at Lancombe offer extremely good value. For example, at the time of writing, a week at October or February half term in a three bedroom cottage here costs under £500; we don’t think you’d find many equivalent holidays at such a good price. 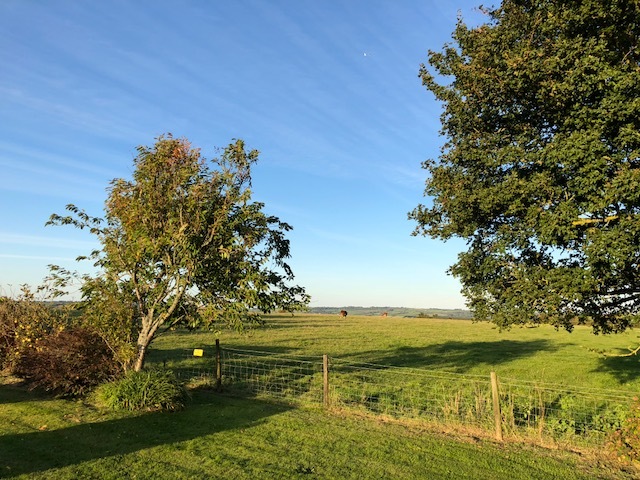 Based on our weekend stay, we think Lancombe offers brilliant value child friendly holidays in a great location, and we’d definitely recommend a visit to any parents planning a holiday in this beautiful part of the country. 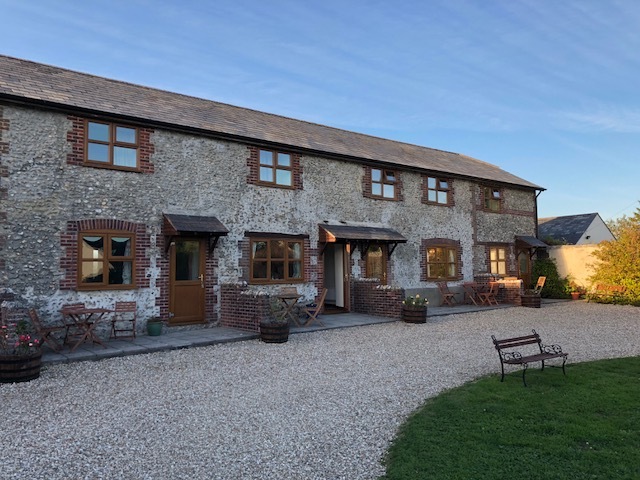 If you’ve been inspired to plan your own holiday at Lancombe Country Cottages & Lodges after reading our review, visit our full listing for more information or visit the Lancombe website directly. Don’t forget to mention that we sent you!